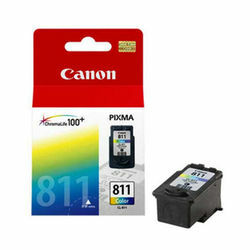 Canon CL-811 cartridge has Cartridge Type Ink. It uses Dye Based Compatible Ink, and its Color Type is Multi-color. This cartridge gives Page Yield of 244 pages. Product(s) is covered under one year* standard warranty from the date of Product(s) purchase by the customer. Warranty period confirmation would be done through either Online Warranty Serial No. Tracking system (WMS) and/or Customer Invoice date or Product(s) installation date, whichever is earlier, but subject to the satisfaction of CIPL /CCC/ ASC. If a Customer transfers the ownership of product(s) to another end user, the remainder of the warranty period may also transfer to the new owner. Customer shall be required to provide proof of purchase as a pre-condition for availing the warranty of the Product(s). Mono Laser Printer LBP2900b, would be covered under 1 year standard onsite warranty starting 01st June 2016 (from existing 2 Years Warranty offerings). MP287 which is covered under six months Onsite Warranty governed by separate terms and conditions. G1000, G2000, G2002, G3000 which are covered under 1 year standard warranty or 15000 prints whichever is earlier. Canon CL-811 cartridge has Cartridge Type Ink. It uses Dye Based Compatible Ink, and its Color Type is Multi-color. This cartridge gives Page Yield of 244 pages.Warranty Period: Product(s) is covered under one year* standard warranty from the date of Product(s) purchase by the customer. Warranty period confirmation would be done through either Online Warranty Serial No. Tracking system (WMS) and/or Customer Invoice date or Product(s) installation date, whichever is earlier, but subject to the satisfaction of CIPL /CCC/ ASC. If a Customer transfers the ownership of product(s) to another end user, the remainder of the warranty period may also transfer to the new owner. Customer shall be required to provide proof of purchase as a pre-condition for availing the warranty of the Product(s). *Except for Mono Laser Printer LBP2900b, would be covered under 1 year standard onsite warranty starting 01st June 2016 (from existing 2 Years Warranty offerings). E510, E560, E610, iP7270, MX477, MX537, MX927, iX6770,iX6870,iX7000, iP110 , iP110, Pro 100,Pro 10, Pro1, MB 5070, MB5370, iB4070 which are covered under 2 years standard on-site warranty MP287 which is covered under six months Onsite Warranty governed by separate terms and conditions. G1000, G2000, G2002, G3000 which are covered under 1 year standard warranty or 15000 prints whichever is earlier.